Time to find some constellations! But first, we have to know what we're looking for. Lets take a stroll down to the Restive Tomb, surely we'll find something there. When you click on the diagonal lines going across the doors, you'll get a message. stonework on the front of the tomb doors. What could it mean? Odd... lets see what Finneus makes of this. that old tomb? How intriguing. I wonder what it could refer to? Perhaps there is a matching pair of lines somewhere to be found." Hmm, where would you find a pair of matching lines like this? Your telescope maybe? Make your way to your telescope so you can begin your hunt. To make it a bit easier on yourself, use our Star Mapper. 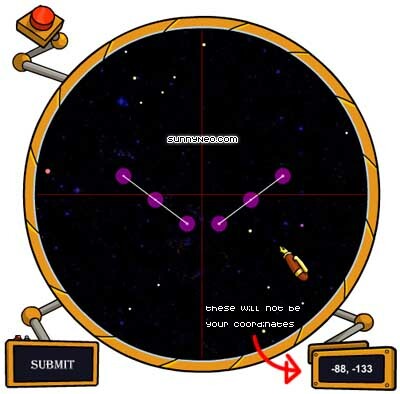 Unlike other Star Mappers, it does not give you the exact coordinates. Our Star Mapper shows you all your sky at once, and has constellation templates to make it dramatically easier to find your contellations. Unlike Star Mappers that simply tell you the constellation coordinates, this is 100% legal and will not put your account in jeopardy. 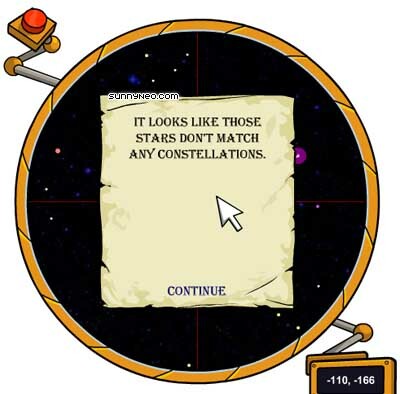 To create a line click on a star, then click on another star close to it. You should see a line now. If you mess up and add a star where one shouldn't be, or connect the wrong ones, you can delete your mistakes. 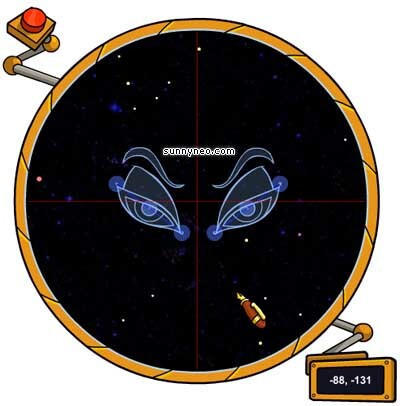 Hover over the big red button in the upper left hand corner of your telescope and you will see a scroll. Hover over it to reveal a menu. 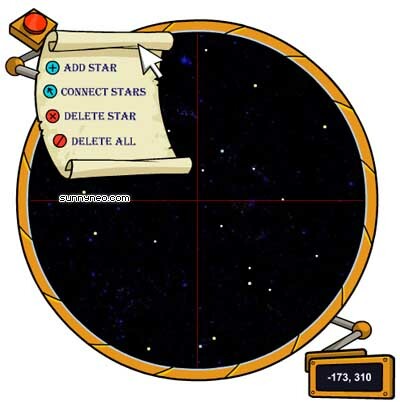 Click 'Delete Star' to get the eraser, and click the star you want deleted. Go back to this menu and select 'Connect Stars' to get your original tool back out. Click on Continue. Congratulations! You've just discovered your first constellation: The Sleeper. The janitor shouts at you, "HEY! Stop leaving the lights on in the observatory! It's wasteful! I CAN'T STAND WASTEFULNESS!! RAAARGHH!!" 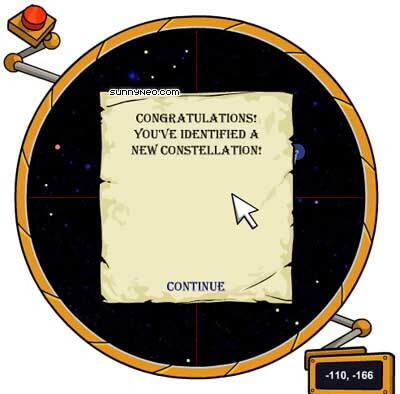 new constellation! That's really awesome, so soon after joining!" one of the greatest astronomers in Altador, if not all Neopia. it out. Well, perhaps there are other constellations to be found." The archivist shuffles over to the Book of Ages and flips it open. Faerie herself... from before. Before she turned evil, and betrayed us." A few other things have been updated as well. If you click on the statue of the Darkest Faerie, then click on the tippy top of the picture, you will see the gems above her head are lit up (this is not required)! Also, if you click on the Book of Ages, it now has a Chapter 1 (also not required)!